The Mayflower was hired in London, and sailed from London to Southampton in July 1620 to begin loading food and supplies for the voyage--much of which was purchased at Southampton. The Pilgrims were mostly still living in the city of Leiden, in the Netherlands. They hired a ship called the Speedwell to take them from Delfshaven, the Netherlands, to Southampton, England, to meet up with the Mayflower. The two ships planned to sail together to Northern Virginia. The Speedwell departed Delfthaven on July 22, and arrived at Southampton, where they found the Mayflower waiting for them. The Speedwell had been leaking on her voyage from the Netherlands to England, though, so they spent the next week patching her up. On August 5, the two ships finally set sail for America. But the Speedwell began leaking again, so they pulled into the town of Dartmouth for repairs, arriving there about August 12. The Speedwell was patched up again, and the two ships again set sail for America about August 21. After the two ships had sailed about 300 miles out to sea, the Speedwell again began to leak. Frustrated with the enormous amount of time lost, and their inability to fix the Speedwell so that it could be sea-worthy, they returned to Plymouth, England, and made the decision to leave the Speedwell behind. The Mayflower would go to America alone. The cargo on the Speedwell was transferred over to the Mayflower; some of the passengers were so tired and disappointed with all the problems that they quit and went home. Others crammed themselves onto the already very crowded Mayflower. 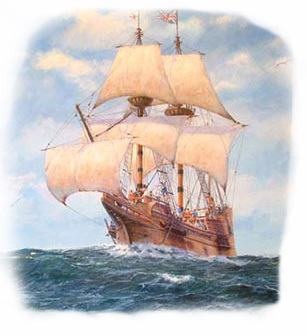 Finally, on September 6, the Mayflower departed from Plymouth, England, and headed for America. By the time the Pilgrims had left England, they had already been living onboard the ships for nearly a month and a half. 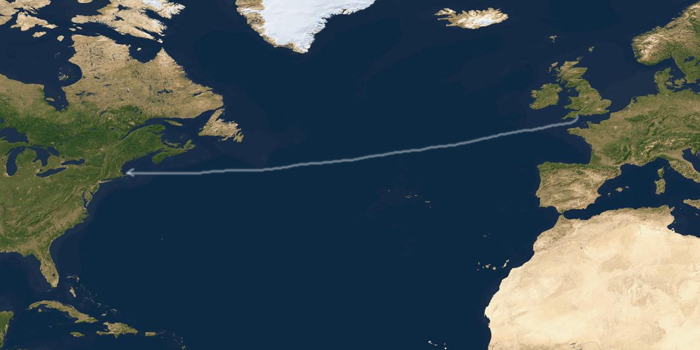 The voyage itself across the Atlantic Ocean took 66 days, from their departure on September 6, until Cape Cod was sighted on 9 November 1620. The first half of the voyage went fairly smoothly, the only major problem was sea-sickness. But by October, they began encountering a number of Atlantic storms that made the voyage treacherous. Several times, the wind was so strong they had to just drift where the weather took them, it was not safe to use the ship's sails. The Pilgrims intended to land in Northern Virginia, which at the time included the region as far north as the Hudson River in the modern State of New York. The Hudson River, in fact, was their originally intended destination. They had received good reports on this region while in the Netherlands. All things considered, the Mayflower was almost right on target, missing the Hudson River by just a few degrees. As the Mayflower approached land, the crew spotted Cape Cod just as the sun rose on November 9. The Pilgrims decided to head south, to the mouth of the Hudson River in New York, where they intended to make their plantation. 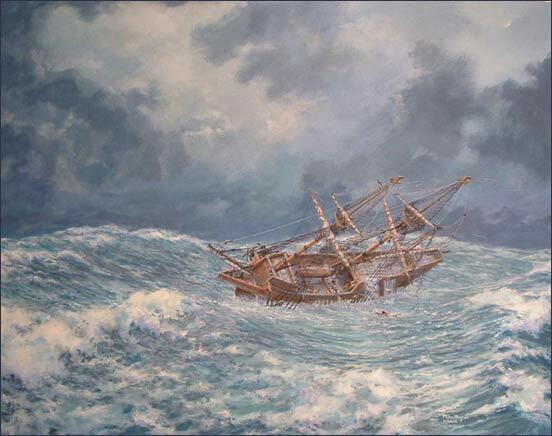 However, as the Mayflower headed south, it encountered some very rough seas, and nearly shipwrecked. The Pilgrims then decided, rather than risk another attempt to go south, they would just stay and explore Cape Cod. They turned back north, rounded the tip, and anchored in what is now Provincetown Harbor. The Pilgrims would spend the next month and a half exploring Cape Cod, trying to decide where they would build their plantation. On December 25, 1620, they had finally decided upon Plymouth, and began construction of their first buildings. 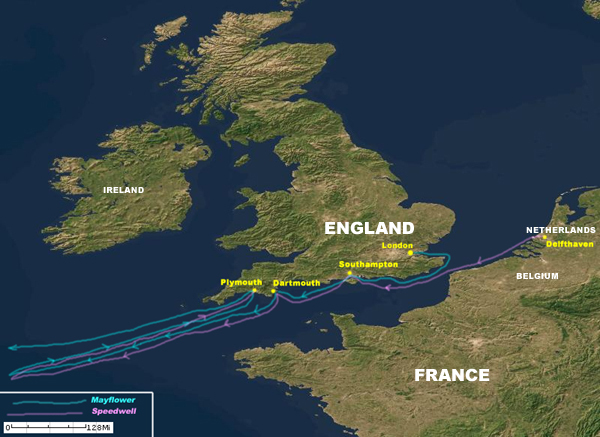 The Mayflower attempted to depart England on three occasions, once from Southampton on 5 August 1620; once from Darthmouth on 21 August 1620; and finally from Plymouth, England, on 6 September 1620. The Mayflower departed Plymouth, England, on 6 September 1620 and arrived at Cape Cod on 9 November 1620, after a 66 day voyage. After sighting Cape Cod, the Mayflower heads south hoping to reach the mouth of the Hudson River in modern-day New York (then a part of Northern Virginia), but were forced back to Provincetown Harbor in Cape Cod after encountering treacherous seas.